Vineyards and villages, wine cellars and bell towers, wine bars and churches: from the north to the south of Italy, the history and culture of many Italian villages are strongly intertwined with wine. Any Italian wine lover should pay a visit to these borghi and their areas of production, for a chance to meet the local producers and taste the wine where it’s produced; and even if you’re not into wine, places like Barolo and Soave, Castelvetro and Radda in Chianti, Capriolo and Montefalco, Offida and Venosa, Manduria and Aggius offer so much, in terms of historic charm, architectural treasures and natural landscapes, that a trip is worth anyway. We take you on a journey to ten of Italy’s wine villages. We begin with north-central Italy. 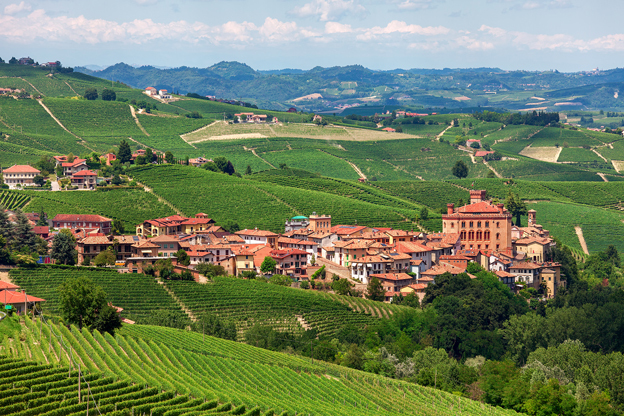 In the heart of the Langhe, in the northern region of Piedmont, Barolo is synonymous with excellence; the vineyards that surround it produce one of the most prestigious wines in the world, which takes its name from the village itself. Barolo, produced exclusively with Nebbiolo grapes, ready after an ageing period of 38 months, is the star of the table here, paired with braised meat, truffle, game and roasts. Stop by the Museo del Cavatappi (Corkscrew Museum), a unique journey into the history of one of the most interesting objects related to wine. The beautiful Castello dei Marchesi Falletti is a must visit, both for its historic relevance, which begins in the 10th century, and for the WIMU-Museo del Vino (Wine Museum), to learn more about Barolo in its 25 exhibition rooms. 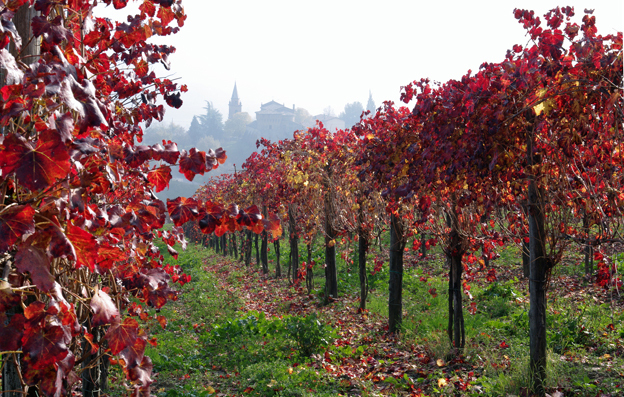 In Lombardy, the territory around Brescia is where bubbly Franciacorta is produced. 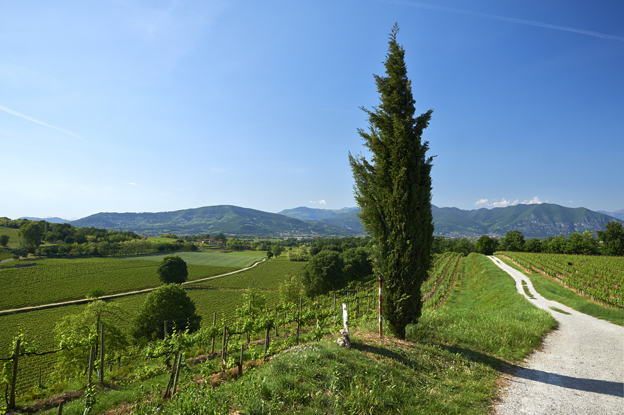 Surrounded by vineyards, in the heart of Franciacorta production, Capriolo is located in the hilly area south of Lake Iseo. Named for the first time in a document dated from 879, Capriolo was equipped with a castle between the 9th and 10th centuries, which would become a stronghold at the center of many feudal struggles in the Middle Ages, as battles were fought between Bresciani and Bergamaschi for control of the area. Other architectural treasures to see are the parish church of San Giorgio Martire, the Sanctuary of Sant'Onofrio, located on the top of the hill overlooking the village, and the church of San Carlo Borromeo Vescovo. Straw yellow in color, dry and intense, Soave wine is produced in the area that surrounds the village by the same name, located about 20 kilometers from Verona. Soave pairs well with first courses such as rice with ‘ghiozzo,’ a fish that is typical of the Venetian lagoon, seafood dishes such as baked orata, and meats like cotechino. 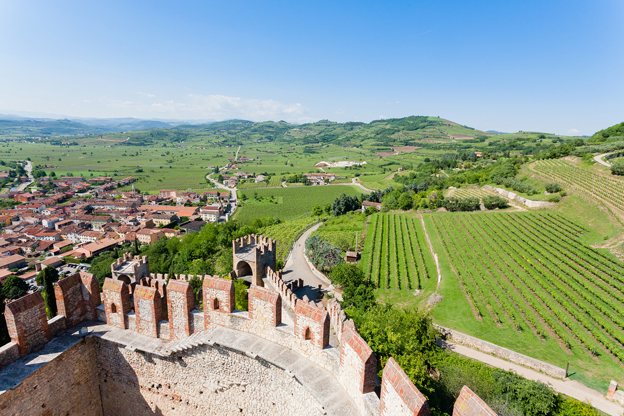 Explore the area, rich with historic castles and villas, steeped in wine culture, along the “Strada del Vino Soave,” (Road of the Soave Wine). In Soave itself, the heart of this territory, there are many remnants of its long history, a Roman pagus first (rural territorial district), then a fortified stronghold in the Middle Ages; in the 14th century, the Scaligeri, lords of Verona, encircled it with walls and built 24 towers and a castle, today among the most beautiful in the region, with its frescoed rooms and antiques. Soave has many historic buildings, including the Palazzo di Giustizia, built by the Venetians, with a beautiful portico; the Palazzo Scaligero, dating back to the 14th century; the 15th-century Palazzo Cavalli, in Gothic-Venetian style; and the Renaissance Palazzo Pieropan. In Castelvetro, since 1994 “Città del Vino” (Wine City), the towers erected during medieval times stand out against the fertile countryside rich in vineyards that surround this village in the province of Modena in Emilia-Romagna, heart of the production of Lambrusco Grasparossa. Fragrant, with a ruby ​​red color, intense foam, and a flavor that ranges from sweet to dry, Lambrusco Grasparossa pairs well with first courses seasoned with meat, roasts, cheeses and baked pasta. Stop by a local winery, maybe in September, when Lambrusco is celebrated during the ‘Sagra dell’Uva e del Lambrusco Grasparossa’ (Grape & Lambrusco Festival), which features tastings, shows, markets, and the parade of the Carri di Bacco (Bacchus Floats). Don’t miss the Castle of Levizzano Rangone, which belonged to the Marquis Bonifacio di Toscana, father of Matilde di Canossa, “la Gran Contessa” (the Great Countess); it’s one of the architectural jewels of the area, with its beautiful Bishop’s rooms, ancient wooden ceilings and frescoed decorations depicting chivalry scenes. Nestled among vineyards, Radda is in the heart of Chianti Classico production, the Tuscan wine famous and appreciated all over the world. With a lively ruby color, a balanced and slightly tannic flavor, Chianti is excellent with aged cheese, roasts, game and savory first courses. Radda itself, at the heart of Chianti production, is enclosed within partly intact walls, evidence of the strategic importance of the village in the Middle Ages; its main road leads to the main square, where the 15th-century Palazzo del Podestà, for four centuries home to the Captain of the Lega del Chianti, is located. On the square is also the parish church. 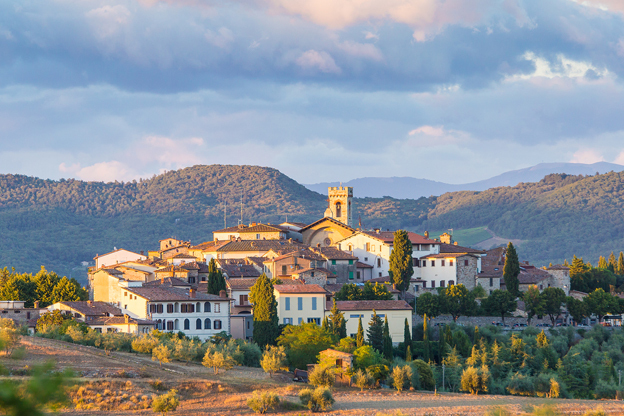 Beyond Radda, go on a road trip among the vineyards of the area, stop by local cellars, wine shops and historic producers, in this enchanting corner of Tuscany between Florence and Siena that is impossible not to love. Stay tuned for Part Two, where we explore the wine villages of central and southern Italy.